Per a recent report from the International Renewable Energy Agency (IRENA), renewable energy capacity continued increased by nearly 8 percent in 2018 with global additions of 171 gigawatts (GW) of power. The increase was driven by new additions from solar and wind energy, which accounted for 84 percent of the growth. Nearly one-third of global power capacity is now derived from renewable energy, and nearly two-thirds of all new power generation capacity added in 2018 was from renewables. Asia accounted for 61 percent of new capacity in 2018, which brings the region’s total to over one Terawatt of renewable capacity. Asia now produces 44 percent of the global renewable energy total. Asia and Oceania were also the fastest-growing regions, with growth of +11.4 percent and +17.7 percent, respectively. Europe expanded by roughly the same amount as last year with the addition of 24 GW (+4.6 percent), and expansion in North America was marginal at 19 GW (+5.4 percent). Capacity growth in Africa was also marginal at 3.6 GW (+8.4 percent). IRENA’s report also compared the growth in generation capacity of renewables vs. non-renewable sources–primarily fossil-based fuels and nuclear. While non-renewable generation capacity has decreased in Europe, North America and Oceania by about 85 GW since 2010, it has increased in both Asia and the Middle East over the same period. 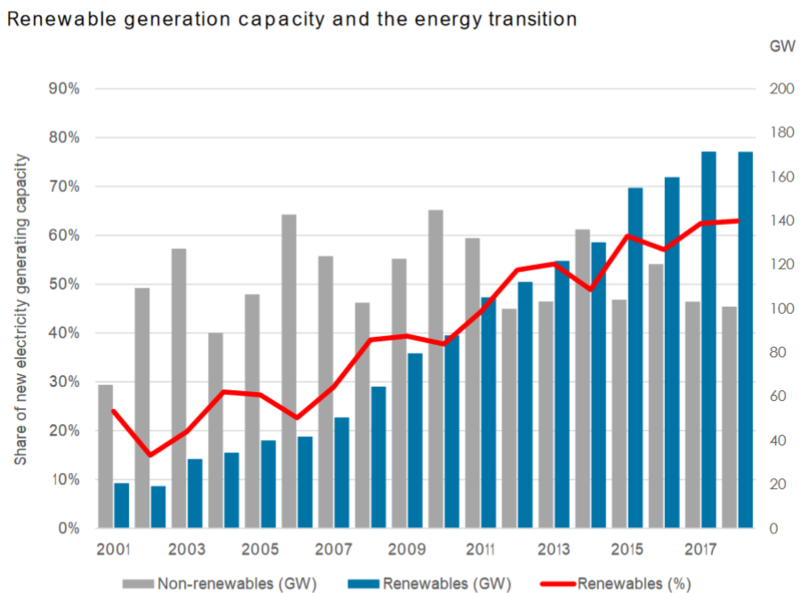 Since 2000, non-renewable generation capacity has expanded by about 115 GW per year on average. Wind energy: Global wind energy capacity increased by 49 GW in 2017. China and the US continued to account for the greatest share of wind energy expansion, with increases of 20 GW and 7 GW, respectively. Other countries expanding by more than 1 GW included Brazil, France, Germany, India and the UK. Solar energy: Solar energy capacity increased by 94 GW in 2018 (+ 24 per cent). Asia continued to dominate global growth with a 64 GW increase (about 70% of the global expansion in 2018). Maintaining the trend from last year, China, India, Japan and South Korea accounted for most of this. Other major increases were in the US (+8.4 GW), Australia (+3.8 GW) and Germany (+3.6 GW). Geothermal energy: Geothermal energy increased by 539 MW in 2018, with most of the expansion taking place in Turkey (+219 MW) and Indonesia (+137 MW), followed by the US, Mexico and New Zealand. 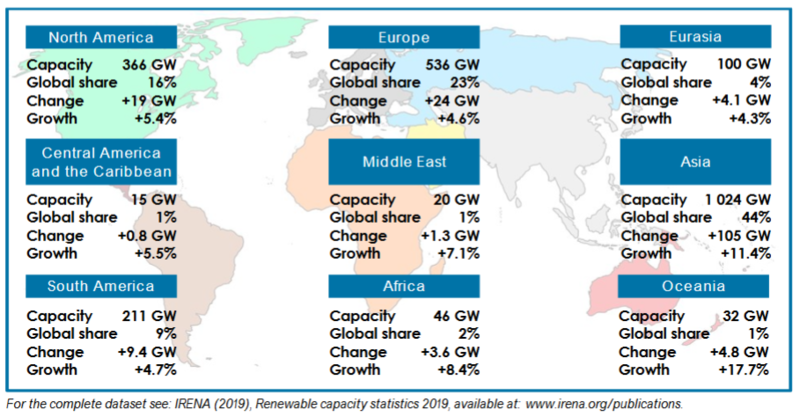 Globally, total renewable energy generation capacity reached 2,351 GW at the end of 2018, which is roughly a third of total installed electricity capacity. Hydropower now accounts for the largest share with an installed capacity of 1,172 GW—around half of the total. Wind and solar energy account for most of the remainder with capacities of 564 GW and 480 GW, respectively. Other renewable capacities include 121 GW of bioenergy, 13 GW of geothermal energy and 500 MW of marine energy (tide, wave and ocean energy).